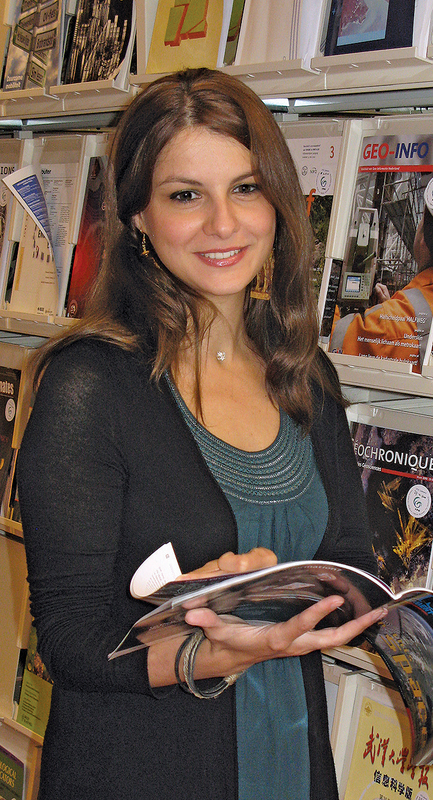 Nino Kheladze in the ITC library, checking the latest literature in her domain of science. GIS has changed Nino Kheladze’s life, and the present-day tools that the field offers and with which she works make her realize that she had made a fundamental career switch back in 2003. With a BSc degree in management and microeconomics under her belt, she then joined the consulting firm Geographic in her home country, Georgia. She quickly understood that this working environment demanded new skills, so she applied for an ITC short course on spatial data handling (see “ITC’s History“). That initial bit of coursework whetted her appetite, and soon she registered for more courses at ITC, resulting in back-to-back degrees: a professional master’s in geoinformation management in 2008 and an MSc degree in government and spatial information management in 2011. Her MSc thesis work was devoted to the particularly serious societal domain of disaster risk management. Georgia is a mountainous country where earthquakes, floods, and landslides are not uncommon. So when CENN, the Caucasus Environmental nongovernmental organization (NGO) Network, asked her to join its team on the ongoing Institutional Building for Natural Disaster Risk Reduction (called MATRA) project in Georgia, Kheladze did not hesitate. MATRA was run by ITC and CENN and funded by the Dutch Ministry of Foreign Affairs’ Social Transformation Programme for Central and Eastern Europe, which aims to build institutional capacity for natural disaster risk reduction in Georgia and raise both public and institutional awareness on natural hazards and risks. Kheladze became the CENN team lead on atlas development, which involved the construction of both a paper and online atlas of Georgia’s disaster risks, two flagship results of the project. This was the first time that such an atlas was compiled in Georgia. 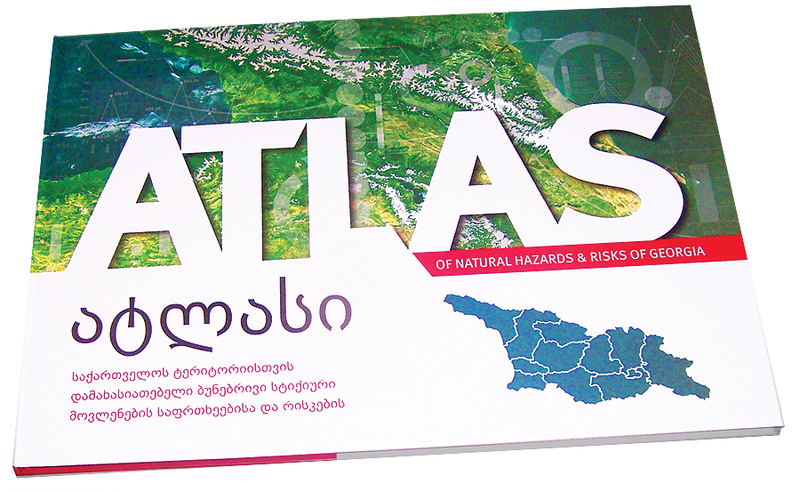 The main goal of the risk atlas is to provide national and local governments, businesses, and the Georgian population with information about existing and potential natural hazards, risks, and socioeconomic vulnerability. It is in this context that Kheladze’s education started paying off: she understood how to leverage ArcGIS functionality in an international cooperation setting with ITC colleagues Cees van Westen, Wim Feringa, and Ulan Turdukulov, which allowed sharing of data and map designs easily and which gave her the functional system robustness that such a context demands. The atlas is seen by all involved as a true example of great collaboration and idea sharing diagonally across Europe. Both paper and online versions can be viewed, respectively. 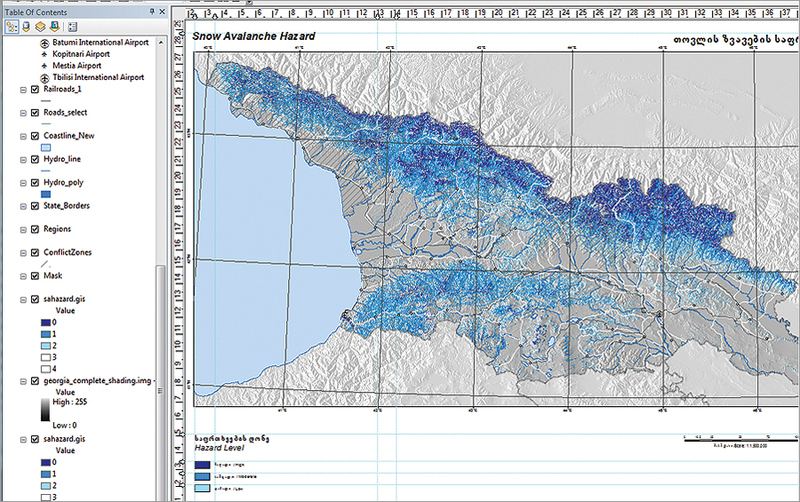 One of the map products, a five-class snow avalanche hazard map in ArcGIS. Initiating and working with the risk atlas at a national scale was quite challenging, as there was a need of large-scale spatial data handling to prepare the respective indicators required for the risk analysis at national scale (social, economic, physical, and environmental vulnerability assessment and different types of hazard assessment). Handling and managing these amounts of spatial data were greatly facilitated by ArcGIS software, which provides many tools to realize different spatial data processing tasks (accomplished by visualization) in the limited time frame that was allocated for the atlas development. A special workflow was even designed. Every year, many students from the Americas, Africa, and Asia come to ITC—of the University of Twente in the Netherlands—with the prospect of giving their GIS or remote-sensing careers a substantial boost. They do so with the understanding that the ITC degrees are recognized in the global job market as being of high quality and durability and that the degree is a great entrance ticket to work in GIS in globally operating organizations, such as the World Bank and the United Nations (UN). Indeed, the relationships with the UN are strong: ITC is the home of two UN University Schools, one on disaster risk management and the other on land administration studies. A wide spectrum of geoinformation application fields is covered by ITC’s educational offerings, which range from technician all the way to PhD-level courses, with the MSc courses being the most prominent and most attended. Fields include water resources, natural resources, urban and rural planning, and earth systems analysis, each of which is addressed from a geoinformation and earth observation perspective. These studies tackle the grand societal challenges of our times: climate change; the urban/rural balance; disasters; food security; and the scarcity of other resources such as freshwater, minerals, and arable land, to name a few. In addition to the above, the technological field of geoinformatics caters to the more technology-savvy student. In combination, these fields are especially addressing the needs of those who want to develop their GIS careers in the truly international domain, possibly in or for the continents away from the industrialized North. To make it all happen, ITC regularly teams up with large international entities like the UN, the World Bank, continental development banks, and international donor and charity schemes, thus creating internship and project opportunities for our students in problem domains that are international, exciting, and challenging. The book version of the risk atlas. ITC is a miniworld in itself, a true melting pot with many nationalities represented in the students and staff alike. Study facilities are modern and immersive and invite students to collaborate. Enschede is a real student city, with great cultural and sports events, and because it is only two train hours away from Amsterdam Schiphol airport, excursions to the other great European capitals are both cheap and easy to arrange. Of equal importance is the cost structure of a study at ITC. As our institute has historically focused on students from developing and emerging economies, the aim has always been to keep courses affordable. For students from the North American continent, this means that even with airfare, our fees are highly competitive, and the prospective student would be wise to verify this at our website, where the latest tuition scheme is provided. And what about Kheladze? She currently works on a variety of follow-ups of the disaster risk management project, still very pleased with her ArcGIS platform; keeping the information up-to-date; improving the uptake of the system by local communities; and developing more tools that utilize the infrastructure. She is also contemplating a return to ITC one day soon . . . one more time, to obtain her PhD. Rolf A. de By is an associate professor in the Geo-Information Processing department at ITC/University of Twente. Tom Veldkamp holds a full professorship in spatial environmental quality and is also ITC’s rector/dean. Nino Kheladze is project coordinator at the Caucasus Environmental NGO Network in Tblisi, Georgia. For more information, contact John Horn, ITC senior project officer, or visit www.itc.nl/usa, or Rolf A. de By, and Nino Kheladze.